How well do you know your car windows? You look through them every time you drive but do you know what their different functions are? Do you know your windscreens from your side windows, or how a professional tint can help? In this article, we’re going to explore the anatomy and the innovation of car windows. Get ready to separate your windscreens from your side windows while exploring the best inventions in the world of auto glass. Prior to 1940, car windows were manually operated. Passengers would have to wind down the windows themselves if they wanted fresh air (could you imagine?!). In 1940, Packard introduced the first power window in their Packard 180 series. Unlike today’s models, these windows were powered by a hydroelectric system. In 1954, Ford became the first car manufacturer to have full power windows in its four-door sedans. Fast-forward to 2017 and power windows are found in all new cars. Manufacturers such as Holden and Mazda have even innovated switch placement, putting the window controls in a centre console for easy, distraction-free, single user access. During the hot summer months, our car interiors are exposed to extreme heat. If the weather is 30 degrees outside, the inside of your car can sometimes be twice as hot! Tinted windows are an ideal solution for this, reducing the amount of heat that enters your interior on a summer day. Most car manufacturers offer an initial tint with their car but there’s always the option to go darker. If you do, it’s best to consult a window specialist to determine how dark you can and should go. Window tinting was first used in America around the time of World War 2. Unfortunately, the inferior window film used at the time created an uneven surface and provided no real benefit to an owner. From the 2000’s onwards, the film has been made from ceramic. Manufacturers found that ceramic lasts longer than other materials and that it effectively blocks out UV rays. The lifespan of these windows can be as long as 20 years and a quality product won’t bubble or discolour under the extreme heat. Most importantly, ceramic doesn’t interfere with any of the electronics in your car, allowing you to have a safe, stylish drive. What Are Windows Made from? 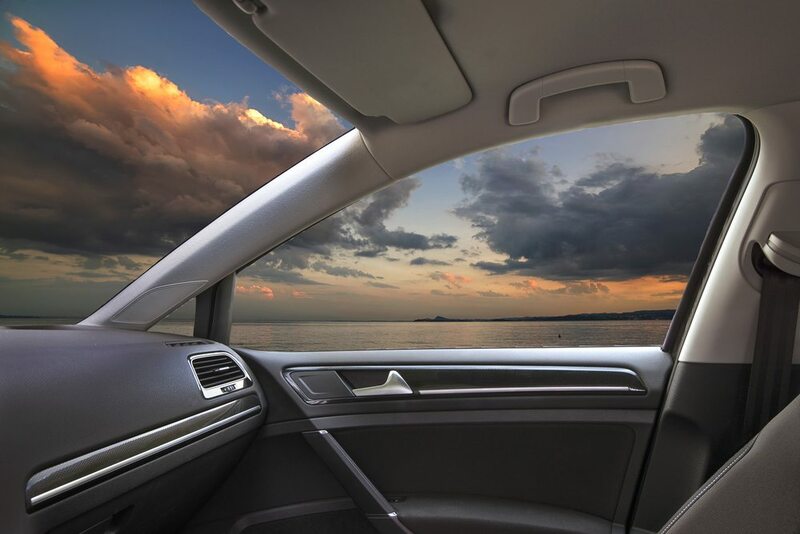 Car windows are primarily manufactured using – you guessed it – glass. But not all windows are the same. Your windscreen is the strongest window in your car. It’s the first line of defence in a serious accident and it is made using a lamination process. Laminated glass is made from individual pieces with a thin layer of vinyl between them. The pieces are then laminated together by applying heat and pressure. Side and rear windows are made from tempered glass. The glass has been specifically designed to disintegrate into minuscule shards when shattered. This reduces the likelihood of being injured by a shard of automotive glass in a car accident. Windows are our speciality and as a leading windscreen repairer, our service is first-class. If your vehicle’s windows need repairs, contact us today. The technicians at Advance Auto Glass have more than 20 years of experience in repairing and replacing glass windows. We also provide superior window tinting services that meet your needs. For more information, get in touch for a quote today.